How to create a Lesson using the Board Game Component? This component provides a better way to evaluate the users’ knowledge in an interactive manner. They solve puzzles laid out on a board and click level icons to enter a level. Users are rewarded with success videos when they succeed and failure videos when they fail in each level. At the very end of the game there is a final reward video and a summary. This component’s background, icons, videos and all other contents are customizable. You can use this component when you want the students to answer in an interactive manner. 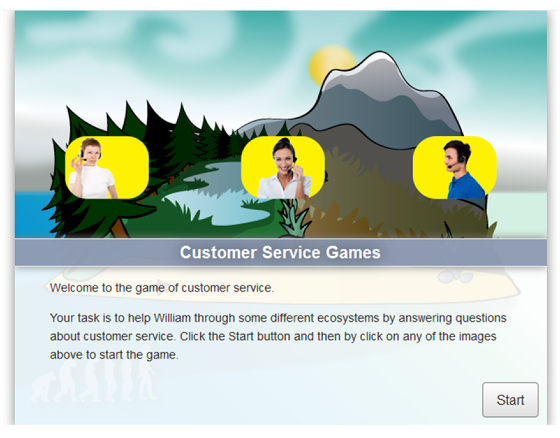 You can place Multichoice, Fill in the Blanks and Drag and drop questions here and there on the Board Game which will increase the enthusiasm of the students especially children. Then he/she clicks on any of the images on the home page to play that quiz, i.e. mini game. These images are called Hotspots. In that mini game, the user clicks the Start Quiz button. The questions appear in slides subsequently, and the user answers them. After answering all the questions, the user clicks the Finish button. If the user has got enough points in the quiz, he will be shown a victory video. Otherwise, he/she will be shown a video indicating that he/she has failed. The user can also skip that video. The scores are shown for the quiz. The user can click the Finish button to quit the quiz, or click the Show solution button to see the answers. Once the user has clicked the Finish button, he/she will be taken to the home screen. The image for the just finished quiz will have changed depending on whether the user has passed or failed in that quiz. A progress indicator image on the bottom left side will change according to the progress of the user in the Board Game. The progress indicator image will change reflecting the progress of the user each time. Once the user has passed in all the quizzes, he/she will be shown an overall victory video with results. This is one of the most interactive components in the Responsive E-learning Components. It can be configured easily. You can upload your own images and videos to the quiz. You can add as many hotspots as possible. You can add introduction texts optionally for the game and quizzes. The hotspots can be placed as per your design on the home page. You can have several questions in slides inside a quiz and your progress in these slides can be highlighted in dots or text. You can explicitly set the pass percentage for the quizzes individually. Most of the options in this component are optional and you can use them as per your design. You can also create a simple Board Game with minimal options. You can customize all the messages that appear in the game. 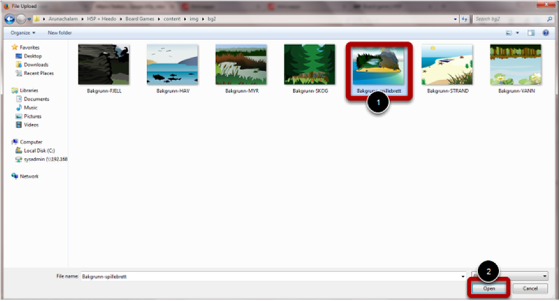 Then click on the More elements  icon and click the Board Game  component icon as shown in the above image. You will see a screen similar to the image shown below. Set the width and height of the board in the Board size  fields. Enable the dropshadow effect around the board by clicking on the Enable dropshadow  checkbox. Add a description to the game on the Game introduction: Start  field. Add hotspots for the game. You can type the title of the hotspot in the Title  field under the Hotspots title. Add a generic or initial image for the hotspot using the Hotspot image  field. 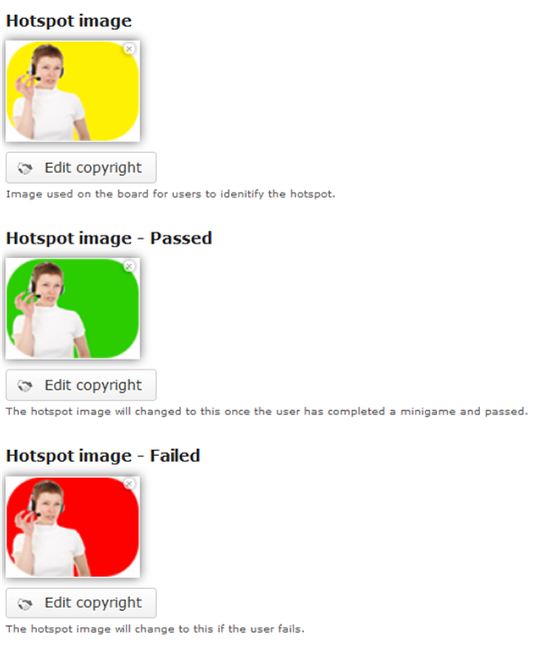 Add an image to indicate that that the user has passed in the quiz using the Hotspot image Passed  field. 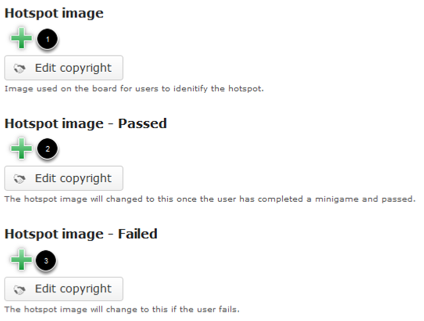 Add an image to indicate that the user has failed in the quiz using the Hotspot image Failed  field. Add introduction to the mini game under the Quiz introduction  field. Add an optional background image for the Question set using the Background image  field. Select the format of the progress indicator under Progress indicator  field. Set the minimum percentage to pass in Pass percentage  field. Select the type of the question in the Question type  dropdown box. Add more questions by clicking the Add question  button. Set the format in which the quiz results are displayed under the Quiz finished: Your result:  field. Add more hotspots by clicking the Add hotspot  button. Enable and update the progress indicator under the Progress indicator  field. Add a video marking the end of the game under the Game finished: Skip video  field. Display overall results and enable retrying under the Game results: Try more  field. Enter the title of the game in the Game title field as shown in the above image. You can add an optional background image by clicking the ‘+’ button shown in the above image. You will see the below screen. Go to the relevant folder in the window that appears and select the background image  that you want to add. Then double click on the image or click the Open  button as shown in the above image. You can see the image being uploaded as shown in the above image. Once the image has been uploaded, you can see the uploaded image as shown in the below image. You can remove the uploaded image file by clicking the Remove file  icon shown above. You can also click the Edit copyright  button to update the copyright details of the image. Once you click this button, you will see the below screen. 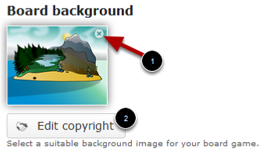 You can update the copyright details of the image in the above screen and click the Close button shown above to save the changes. Specify how much space the board game should take up. The dimensions should be mentioned in pixels. Please note that the aspect ratio should match the background image that you've just uploaded in the previous step. Enable a drop shadow around the board by clicking the Enable dropshadow  checkbox shown in the above image. If this option is enabled, the board takes up more space than the board size suggests. You can add some introduction text for the game by clicking the arrow button  shown in the picture in step 6. Once you click it, you will see the above screen. In this screen, you can enter the introduction text in the Welcome and instruction text  field. You can also format the text. You can also change label text of the button the user has to click to start the game in the Button Text  field. In our case, we have typed Start. Start adding hotspots under the Hotspots title. You can add the title of the hotspot in the Title field shown in the above image. Hotspot image: This is the image that will appear initially for the hotspot on the board’s home page. You can upload an image for this field by clicking the + icon under the Hotspot image  field. Hotspot image - Passed: This is the image that will appear on the board’s home page if the user has passed in the relevant mini game. You can upload an image for this field by clicking the + icon under the Hotspot image - Passed  field. Hotspot image - Failed: This is the image that will appear on the board’s home page if the user has failed in the relevant mini game. You can upload an image for this field by clicking the + icon under the Hotspot image - Failed  field. 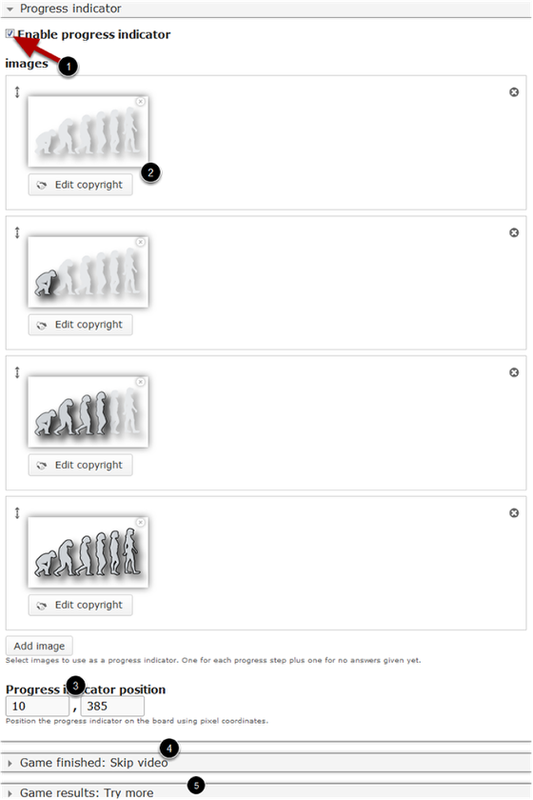 You can follow step 4 to upload images and update the copyright details of the images. The resultant page will look like the below image. You can change the way the progress of the quiz is shown. Click the Progress indicator dropdown menu shown above and select any of the below two available options. By default, the progress indicator is set to Dots as shown in the above image. Set the percentage of total score for passing the quiz in the Pass percentage field as shown in the above image. You can check the documents for these components to learn about the settings and how to create questions with these components. 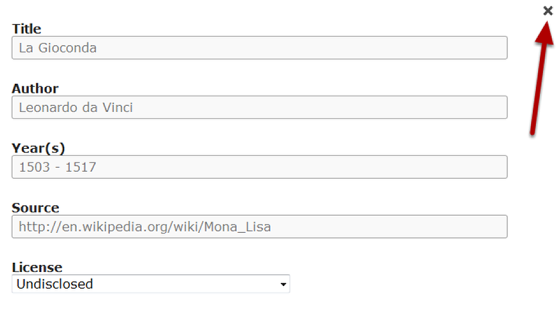 Once you’ve added a question, you can add more questions by clicking the Add question  button shown in the above image. You can also delete a question by clicking the Remove  button shown in the above image. You can optionally change the way the results are displayed after the quiz is finished. To do that, click the arrow button  shown in step 11.You will see the above screen. A short description about the fields in the above image can be seen below. Display results : Check this checkbox if you want to display the results. This button will override all the options you update in the above screen. This is checked by default. Feedback heading : This heading will be displayed at the end of the quiz when the user has answered all questions. Score display text : This text used to display Total user score. "@score" will be replaced by calculated score, "@total" will be replaced by maximum possible score. Quiz passed greeting : This text will be displayed above the score if the user has successfully passed the quiz. Passed comment : This comment will be displayed after the score if the user has successfully passed the quiz. Quiz failed title : This text will be displayed above the score if the user has failed the quiz. Failed comment : This comment will be displayed after the score if the user has failed the quiz. Solution button label : The text that will appear on the Solution button. Finish button text : The text that will appear on the Finish button. Display video before quiz results : If you add a video to be displayed just before the quiz results are displayed, then check this checkbox. Enable skip video button : If you want to enable to skip the video while it plays after displaying the quiz results, check this checkbox. Passed video : Add a video that will be played if the user successfully passed the quiz. Fail video : Add a video that will be played if the user successfully failed in the quiz. To add a video, click the + icon in this field, go to the specified folder, select the video and double click on it or click the Open button. You can also edit the video’s copyright details by clicking the Edit copyright details button below the + icon. Please note that you can upload videos only in .mp4 and .webm formats currently. Once uploaded, the videos will be shown on the screen just like the above picture. You can add more hotspots by clicking the Add hotspot button  shown above. Thereafter, you can update the hotspots by following the steps we saw earlier. On the above image, you can see 3 hotspots added to the board. You can remove a hotspot by clicking the Remove Hotspot  and move the hotspots by dragging and dropping the double headed arrow  shown in the above image. You can add images to notify the user's progress in the game. To do that, check the Enable progress indicator  checkbox shown above. By default this checkbox is unchecked. You can add a series of images as per the number of quizzes in your board game. For example, we have 3 quizzes, so we need to upload 3 images showing progress and one another image to show that the user hasn't started or passed in any quizzes. In the above image, you can see an image  has been initially added. This image will be shown if the user hasn't started or passed in any quizzes. You can also see 3 subsequent images have been added to be shown according to the progress of the user. You can also edit the copyright details by clicking the relevant buttons. You can set where the progress indicator should be shown in the Progress indicator position  fields. You have to mention it in pixel coordinates. This is the final video that will be displayed after the user has passed in all the quizzes and just before the overall scores are displayed. To enable the video, click on the arrow button the Game finished: Skip video  field in step 15. You will see the above screen. On this screen you can upload a video by clicking the + button under the Finished video  title. If you want to allow the user to skip the video while playing, check the Allow skipping of finished video  checkbox. You can also update the label for the button the user has to click to skip the finished video in the Skip button text  field as shown in the above image. Result text : The text explaining the game score. Variables: @score, @total, @percentage. 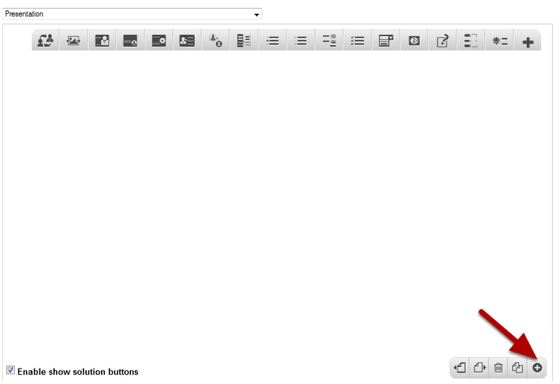 Show solutions button : Label for the button the user has to click to view the solutions. The board size will automatically be updated to the dimensions of the uploaded board background image. However, make sure both are of the same size. Although it seems to be a complicated component, most of the options in the Board Game are only optional. So, you can easily create new lessons with this component. Select simple appropriate images and videos. You can upload thumbnail images in .jpeg, .png and .gif formats only. You can upload videos in .mp4 and .webm formats only. Although not mandatory, it’s advised to add images for Hotspot image, Hotspot image - Passed and Hotspot image - Failed fields. Place the hotspots and Progress indicator position images by trial and error methods, i.e., mention the coordinates, have a preview and then change the coordinates until you place them correctly. Most of the options in this component are self explanatory.